Now I just need to go find time to fish these. Send me the top one,. I know where some muskie are that I will throw it for. 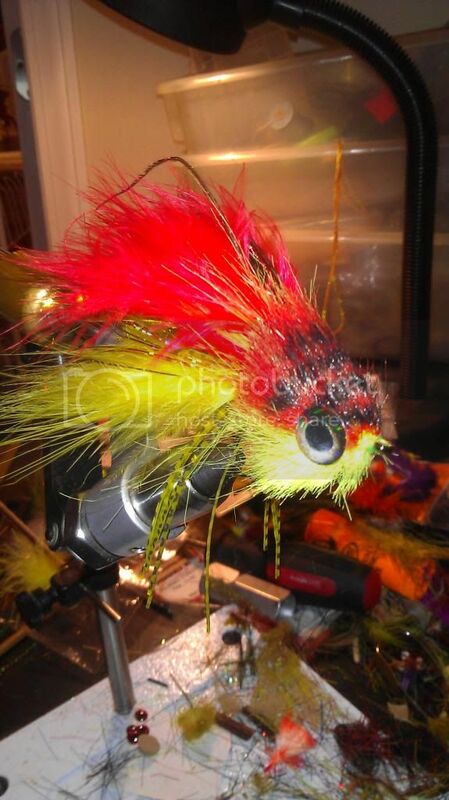 I've been tying the exact opposite, size 14, 16, 18 beadhead pheasant tails, copper johns and partridge and oranges. Its time for winter trout. I've been getting ready for Winter trout too. I've been playing with some stretch tubing on some #16 & #18's. I have a lot more others to tie before I'm ready. 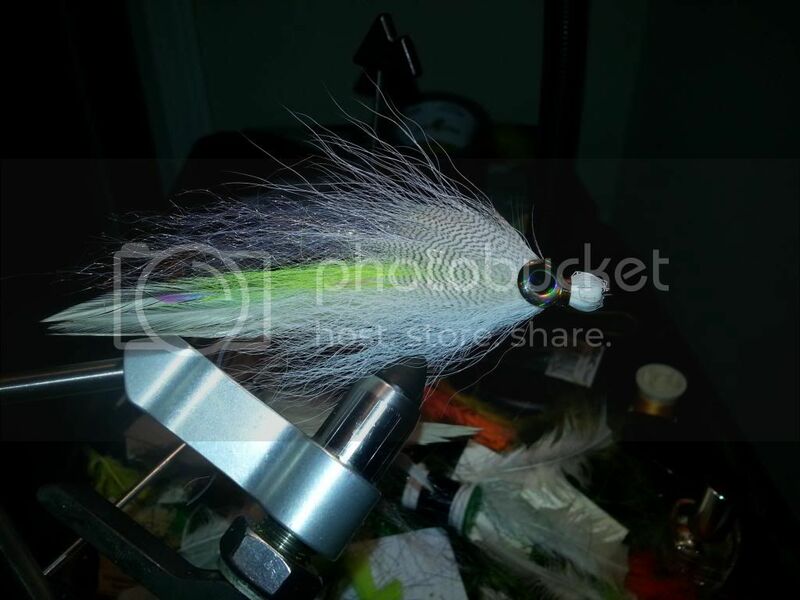 Hawkins' Hat Trick in brown and olive and soon to tie some Barr's Bouface streamers which will double as smallmouth flies. Educated me please. What are these beautiful monsters called? I'm a nympher but as my eyes contiue to fail, these big streamers look more inviting to tie. The top fly is a poor man's version of the fly trigg tied for the brown trout swap wrapping up, I just sized it you a bit. 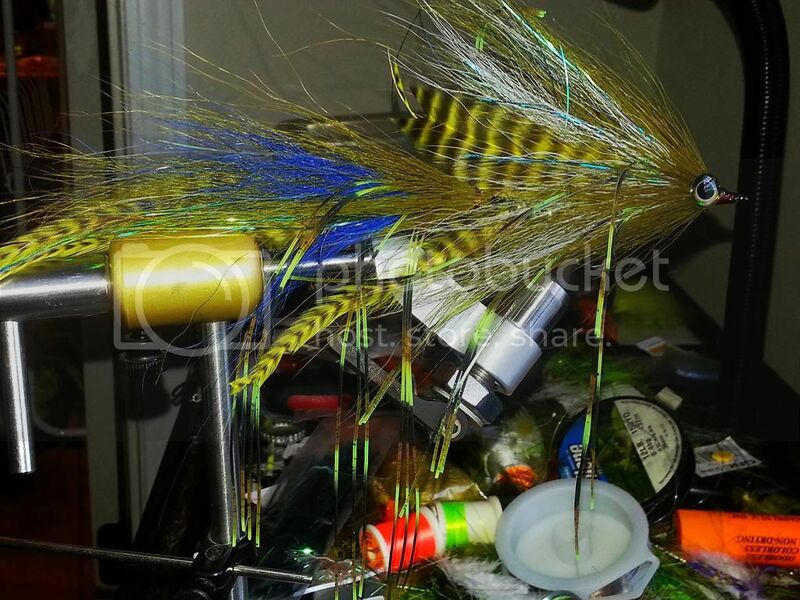 The second fly is just a deceiver with a yellow craft fur and sf flash blend. The bottom is Nick granatos Sasquatch. If you haven't watched Brian's videos you should. This stuff is a blast to tie and fish. Sure the numbers may not be their compared to nymphing but the size and fun of it more than makes up for it. Thanks for the info. If you're talking about Brian Wise, I had the pleasure of fishing with him last year and was aware of his videos. I just haven't been that interested in these big streamers until recently. I'll check him out. I just watched Brian's video on the Double Deceiver, man he's fast! (watch the video and you'll get it). Isn't that big fly on top of the thread something like a double deceiver? I just watched Brian's video on the Double Deceiver, man he's fast!